As promised, here are some pictures of my revamped sewing space. If you read my blog you know I am no photographer, and shooting in a room with a window proved especially challenging, sorry! When my husband and I were house hunting over two years ago, I had not seen anything that thrilled me up until this house. I walked in and immediately fell in love with the dark wood floors that covered both floors, then I went up to the rec-room (a popular southern home feature as we don't usually have basements) and saw a door. On the other side was a tiny room with an arched window and I gasped! Oh, it would have taken a lot more than some hideous tile & weird paint choices (hot pink walls with an orange ceiling, anyone?) to sway me from this house with this room. When you step in the door, this is your view to your left. This old dresser was my husband's parents when they were first married. I repainted it and knocked out some lattice work to add the fabric panels. At my old house this was my sewing space! My machine sat on top of it in a closet and I kept everything inside. My first purchase in our new house was the shelf from Ikea in the corner. It houses books and manuals as well as bins with scraps. Up until last week a large square table, sewing machine/serger on one side, cutting mat on the other, was taking up most of the rest of the room. For Christmas, Andrew wanted me to go ahead with my vision of replacing it with an L shaped counter. We almost splurged for pre-made cabinets and counters, but I decided I would be more than happy with cubbies for legs and MDF board painted for the counters. All in, with paint, three cubbies, 2x4's (to place under the counter and screw into the studs in the wall) & MDF I would say this was about $200. Andrew's one request: "you're not going to buy 21 fabric cubes now, are you?" No sweat, the fabric can stack in there quite nicely, so I just got three, might have to get a fourth. 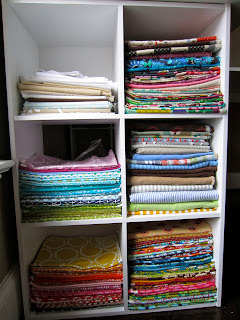 Clearly I need some mini quilts to hang on the wall above my sewing machine! It's quite bare looking. The whole counter is, really. But it sure is nice to have a clean, clear space, so I'm going to focus on that for a while! I love having the extra floor space - I can baste in here now! Well, a small quilt. And the added storage was a bonus. I really love that it's counter height now. Makes standing and cutting so much easier on the back. I have to replace the chair with a barstool, though. For my last birthday Andrew & I painted and installed this pink pegboard (on 2x4's so you have space behind the holes to hang things). It holds most of my non-fabric tools and supplies. Kind of unnecessary now with all the extra counter space & storage, but we won't tell him that. Just one more peek at my favorite bookshelf. I filled this one with basics/linens on the top and rainbow 1/2 yards on the bottom of the left. On the other side is fabric for immediate projects, apparel fabric & then a whole cubbie of Anna Maria Horner - Garden Party, Good Folks, Innocent Crush & Loulouthi. 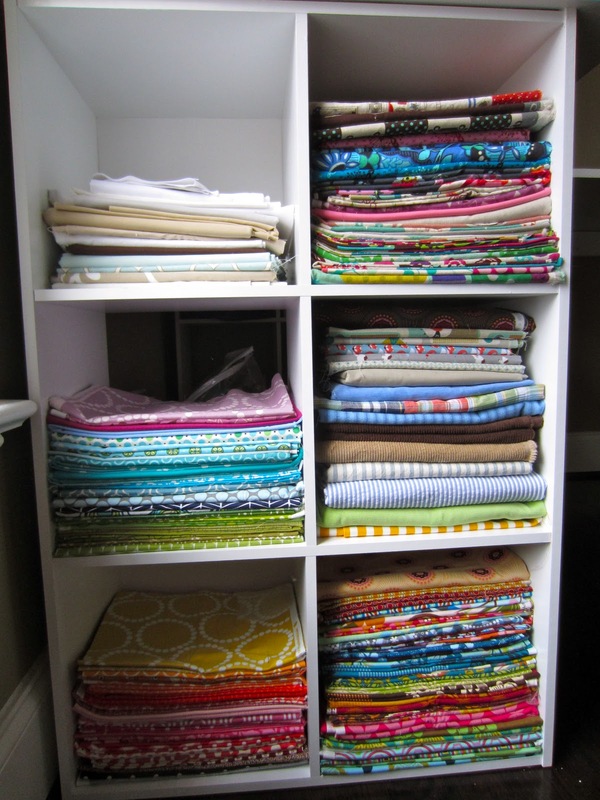 I love having it all out in the open, although it very clearly broadcasts my fabric addiction. I pretty much feel like the luckiest girl in the world. I know there are tons of more amazing sewing spaces out there, but I know that is not the norm. I'm just thrilled to have a little space of my own that I can close the door when it's too chaotic in there. I do have to admit that while it was under construction it was nice to work on projects in the kitchen and not be so isolated. But, shutting the door on the mess that can happen probably beats that out for me! Oh, and one of the previous residents (who were gone before we ever saw it) was a mother that made window treatments - how I would love to see how she had this room set up. I love those floors!!! Your space looks so very inviting. I really like how you did the l-shape with the cubbies. Looks Great! 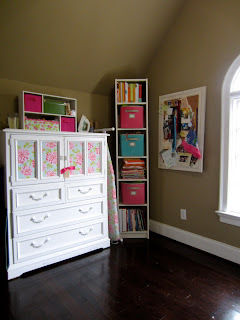 oh and that is the cutest dresser re-do! It looks great. Hardwood floors, great use of space, and natural light. You'll never want to leave. I envy you the pegboard too. looks lovely!! i'm so jealous that you have a whole room. Wow...what a gorgeous, large space to work in...and the lighting is amazing! Thanks for sharing. What a great space! Love the way you have set it up! Looks great. - I am about to re vamp my space , I like the fabric on view it begs to be made in to something then. Your sewing room is to die for!!!! I'm officially jealous!